Today in our Nudge Village Group, one of the “villagers” asked about what template I used in the graphic I showed in an earlier post (The To Don’t post) I was sharing. I have an entire personal management approach that I won’t put entirely in this post, but here are two elements of it. The yearly goals that are leading me toward my greater purpose, but they aren’t really checklist worthy. I reserve that more for the monthly, weekly, and daily goals and activities. For monthly goals, I do need something that I can write on and reference on a daily basis. Plus, I’ve added the “To Don’t” row to that template because I’ve had to discard some things to make room for something better! 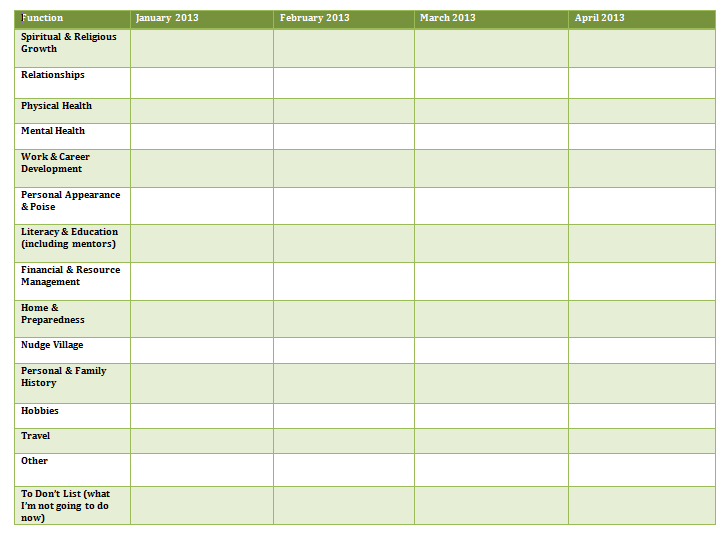 Here’s a copy in MS Word – Goals_2013_samplebreakdown or in PDF – Goals_2013_samplebreakdown if you’d like to replicate it. I’ve actually made mine for six months across the page and I copy it out on a legal or larger size paper. Perhaps I have too many goals! But, I enjoy variety! This is working for me right now for two areas of goals – yearly and monthly. I have an entirely different method for vision, mission, and life goals as well as my daily tasks and notes. Being a full-time employee and a part-time entrepreneur means there is a bit of juggling between systems, processes, and personal note keeping because some of my personal management tools aren’t available at work. But, feel free to share and use. Keep modifying your approach to work for you. Our brains all work a bit differently.